Law firm www.slaterheelis.co.uk this week launches its new sporting sponsorship programme for 2015, which will see the Manchester firm invest over £10k in supporting sport at all levels across Manchester and Cheshire with over eight individual sponsorship initiatives, ranging from Premier League basketball team The Manchester Giants to local and junior sports clubs in Altrincham, Sale, Timperley and Wilmslow. 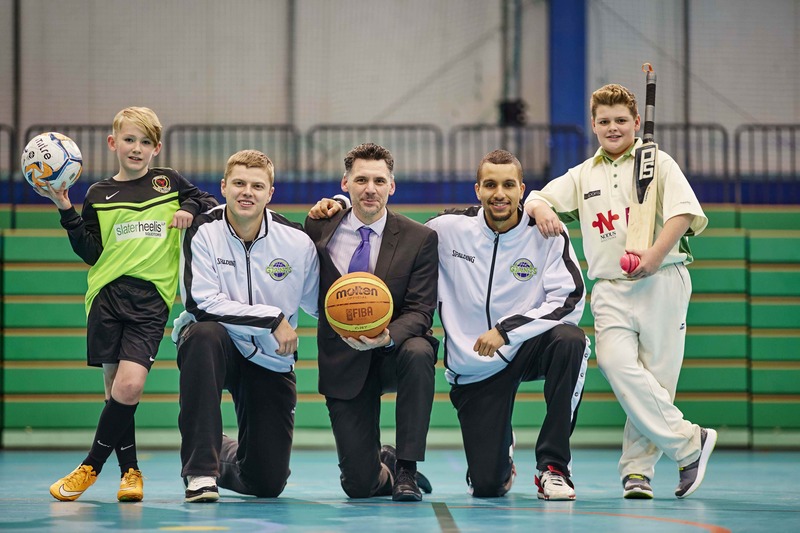 The Manchester Giants players Connor Murtagh and Ingus Bankevics are pictured here with 13 year old Jake Hughes, a young cricketer who plays for Lymm Cricket Club, ten year old Matthew Thornhill who plays for Timperley Junior Football Club and Richard Hughes from Slater Heelis LLP. “Our business has always operated very much at the heart of the community and we understand just how vital sport is to people of all ages. Sport brings people together, encourages self-esteem and has even been proven to boost lifelong learning. Slater Heelis LLP www.slaterheelis.co.uk is a well-respected, full service law firm based in South Manchester and Manchester city centre that has been awarded Lexcel, the national Law Society’s quality mark, for 11 years running. With origins dating back to 1773, Slater Heelis LLP now employs over 120 people who offer legal expertise to commercial and private clients across the fields of employment, property, corporate and commercial, dispute resolution, family, personal injury, conveyancing and wills and trusts. Slater Heelis LLP works with a diverse client base that includes sports personalities, entrepreneurs, national PLC’s, local government and not-for profit organisations.